Wash your face with lukewarm water so that the pores become open. Take required the amount of sea salt and mix it with an equal amount of water. Massage your acne-affected skin with this paste by following a gentle circular motion. Let it sit for 15 minutes and then, rinse off with lukewarm water. Finally, close your pores by splashing cold water. 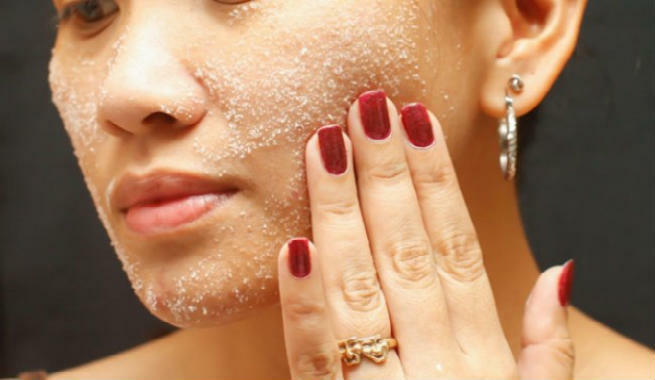 Using sea salt solution is one of the easiest as well as the most common ways to treat acne and its scars. You can use sea salt spray instead of applying the water solution directly to your skin. Prepare the solution just like the previous way. Make sure that it is in the semi-liquid state and not too thick. Pour it into a plastic spray bottle and spritz over your acne. Massage gently for a few minutes with your fingertips and rinse off with tepid water. When mixed with sea salt, honey can increase its efficacy in treating acne scars with its natural anti-bacterial, anti-inflammatory, and healing properties. You can mix 1 teaspoonful of pure, raw organic honey with 1 teaspoon of sea salt and turn it into a paste by adding 3 teaspoons of warm water to it. Apply it to your skin as a mask or only to the troubled parts as a spot treatment. Let it sit for 10 minutes and then, wash off with lukewarm water. If you have a dry and dull skin that is full of acne or its marks, you need this nourishing and rejuvenating mask in your life. To prepare this mask, you will need around 2 cups of sea salt. Pour 1 cup of sweet almond oil (you can use extra virgin olive oil / organic coconut oil / jojoba oil / grape seed oil as alternatives) and 15 drops of essential oil (of your choice) into it. Combine everything together and apply the mask all over your skin. Massage with fingertips for 3 to 5 minutes and then, leave it on for 5 more minutes. Finally, rinse with lukewarm water. The healing properties of aloe vera are quite well-known. Hence, using it with sea salt can make your acne and its scars disappear effectively. Take 2 tablespoons of freshly extracted aloe vera gel in a mixing bowl and add 1 tablespoon of sea salt with it. Combine them together very well so that a smooth paste is formed and there are no aloe gel lumps. Massage it gently into the skin and wait for 5 minutes. Once the mask dries up completely, wash off with plain water. 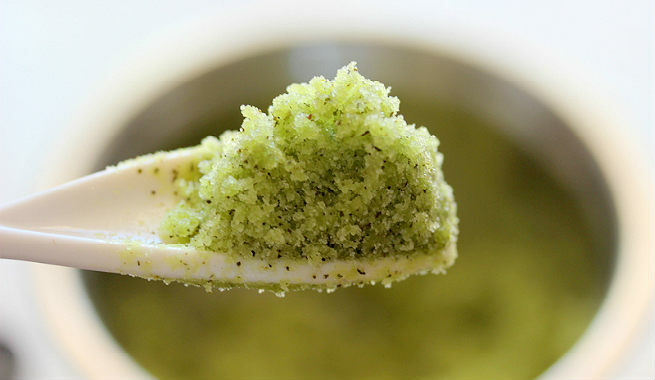 Take 1 tablespoon of sea salt and add (1/2) tablespoon of freshly brewed organic green tea to it. Blend well to form a fine paste and spread it over your skin. Let it dry completely. Then, rinse off with tepid water. The antioxidants present in green tea not only reduce the appearance of acne but also help in getting rid of old scars through faster cell renewal. Start with taking (1/2) cup of sea salt and 1 cup of granulated sugar in a mixing bowl. Pour 3 tablespoons of organic coconut oil into it. Also, add grated grapefruit peel and the juice of the fruit 1 tablespoon each. Lastly, puncture a vitamin E capsule and pour its content into the bowl. Blend everything well and prepare a fine paste of medium consistency. Massage it into your skin in a small circular motion followed by a setting time of 5 minutes. Then, wash off with plain cold water. It works like magic for people with oily, acne-prone skin. A sea salt bath is considered as the most effective natural remedy for treating body acne (chest, back, hands, legs, etc.). However, there are two different ways to try it. The simpler method instructs us to mix 2 cups of sea salt in a running hot bath. Contrarily, you can prepare a blend by combining sea salt, white clay, borax, and a few drops of your favorite essential oil and then, add 5 to 6 tablespoons of it to warm bath water. Once you are done with the preparation, all you need to do is get in the mixture and soak yourself for 20-30 minutes. Follow it by a shower with plain tepid water and rinse away all the salt gradually. Make sure that you repeat the process at least thrice every week in order to see the best results. 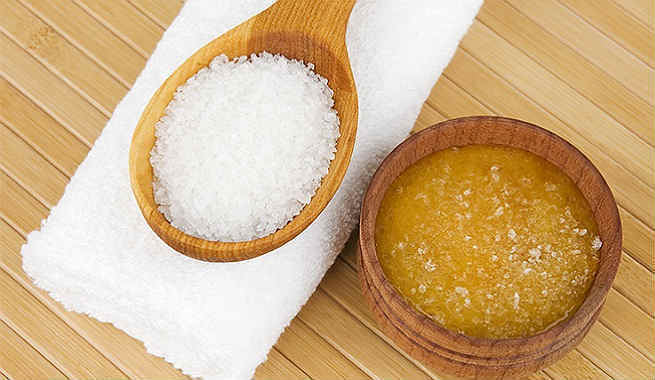 Massaging or scrubbing our skin too hard with sea salt can be quite damaging. Moreover, it can dry out as well as irritate the skin if left on for a considerably longer time. Hence, be gentle with your application and always seal in the natural moisture of your skin by applying an oil-free moisturizer afterward.